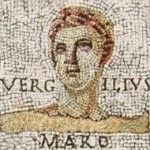 Depiction of Vergil, 3rd Century A.D.
Vergil (70 B.C.–19 B.C.). Æneid. Æneas, mythological founder of the Roman race, leaving Car?thage and its lovely Queen Dido, was driven by a storm to the coast of Sicily. There the hospitality of King Acestes helped him to forget his relinquished love. THE ARGUMENT.—Æneas, setting sail from Afric, is driven by a storm on the coasts of Sicily, where he is hospitably receiv’d by his friend Acestes, king of part of the island, and born of Trojan parentage. He applies himself to celebrate the memory of his father with divine honors, and accordingly institutes funeral games, and appoints prizes for those who should conquer in them. While the ceremonies were performing, Juno sends Iris to persuade the Trojan women to burn the ships, who, upon her instigation, set fire to them; which burnt four, and would have consum’d the rest, had not Jupiter, by a miraculous shower, extinguish’d it. Upon this, Æneas, by the advice of one of his generals, and a vision of his father, builds a city for the women, old men, and others, who were either unfit for war, or weary of the voyage, and sails for Italy. Venus procures of Neptune a safe voyage for him and all his men, excepting only his pilot Palinurus, who is unfortunately lost. Sees on the Punic shore the mounting blaze. How capable of death for injur’d love. Till neither fires nor shining shores they saw. An empty space above, a floating field around. Then night and horror ocean’s face deform. The frighted crew perform the task assign’d. Can stem the torrent of this raging sea. And what collected night involves the skies! Much less against the tempest force their way. ’T is fate diverts our course, and fate we must obey. They scud amain, and make the port assign’d. And held the hero in a strict embrace. And either hand a pointed jav’lin bore. His sire Crinisus, a Sicilian flood. With plenteous country cates and homely store. “Offspring of heav’n, divine Dardanian race! A day for ever sad, for ever dear. And yearly games may spread the gods’ renown. His gods and ours shall share your equal vows. Oppos’d in combat on the yellow sand. And joyful victors wait the just reward. He said, and first his brows with myrtle bound. His temples tied, and all the Trojan race. Paternal ashes, now review’d in vain! A rolling fire along, and singe the grass. Within the hollow tomb retir’d to rest. Or guardian of his father’s sepulcher. New gen’rous wine he from the goblets pour’d. And call’d his father’s ghost, from hell restor’d. Some blow the fires, and offer’d entrails broil. And vests embroider’d, of the Tyrian dye. Advancing, in the wat’ry lists appear. Beneath their sturdy strokes the billows roar. From whom Cluentius draws his Trojan blood. Uncurl their ridgy backs, and at his foot appear. The cormorants above lie basking in the sun. The mark to guide the mariners aright. Then round the rock they steer, and seek the former shores. Besmear’d with oil, their naked shoulders shine. Is rais’d by turns with hope, by turns with fear depress’d. Sparkles the briny main, and the vex’d ocean fries. Dash up the sandy waves, and ope the depths below. Low to the wheels his pliant body bends. And aid with eager shouts the favor’d side. But his o’er-masted galley check’d his haste. The billows lave the skies, and ocean groans below. And, fearing, sought the deep; and still aloof he steer’d. The bold Cloanthus near the shelvings draw. And in a closer compass plow’d the flood. Cried out for anger, and his hair he tore. Turn’d short upon the shelfs, and madly steer’d. Now dropping wet, he climbs the cliff with pain. To see his heaving breast disgorge the briny draught. Whom from the flaming walls of Troy I drew. And o’er the Syrtes’ broken billows row’d. Tho’ yet—but ah! that haughty wish is vain! Let those enjoy it whom the gods ordain. At the full stretch, and shake the brazen prow. Are swell’d, and sweat runs gutt’ring down in tides. Shuts up th’ unwieldly Centaur in the lock. Her oars she shiver’d, and her head she broke. And, anxious for themselves, renounce the prize. And gather from the sea their floating oars. In larger compass on the roomy sea. And, flying with a force, that force assists his way. Wedg’d in the rocky shoals, and sticking fast. And practices to row with shatter’d oars. The ship, without a pilot, yields the prize. Her he pursues, and all his vigor strains. Shouts, wishes, and applause run rattling thro’ the skies. All obstinate to die, or gain the race. For they can conquer, who believe they can. “Gods of the liquid realms, on which I row! Assist to make me guilty of my vow! Push’d on, and sped the galley to the land. And, darting to the port, obtains the prize. Cloanthus conqu’ror of the naval games. And sums of silver, which the crew divide. And needlework its happy cost bestows. With crooked talons bears the boy away. And dogs pursue his flight with imitated cries. And, summon’d there, the second prize he shar’d. In war for his defense, for ornament in peace. Pursued and lightly seiz’d the Trojan train. And two brass caldrons from Dodona brought. Brought back his galley shatter’d with the shock. And, houted by the vulgar, made to shore. But, what she wants in oars, with sails amends. Is pleas’d th’ unhappy chief to recompense. Beauteous herself, with lovely twins as fair. Whose sides were shaded with surrounding wood. By just degrees, o’erlook’d the ground below. A num’rous train attend in solemn state. Desire of honor and the prize invite. The Trojans mix’d with the Sicilian band. Nisus, for friendship to the youth renown’d. Whom time has not deliver’d o’er to fame.